Let’s face it, many of the most effective herbal remedies are decidedly unpleasant tasting. You know deep down that your concoction will do the trick for whatever’s ailing your loved one…if ONLY you could get them to take it! It’s no secret that most people hate the thought of tasting anything bitter. They just aren’t ready to hear that “bitter” is actually good for them. Using raw honey as a medium for delivering the more unfavorable flavors of herbal medicine is an old and favored form of administering these remedies. Raw, unpasteurized local honey is the most useful and medicinal form of honey as it contains many medicinal properties that help fight infection. When taken internally, raw honey is slightly laxative, expectorant, and soothes sore dry mucus membranes especially in the upper respiratory system. Raw honey can also be used externally and is an amazing topical application for burns, scrapes, and abrasions. It also reduces inflammation and encourages smooth healing with less visible scarring. 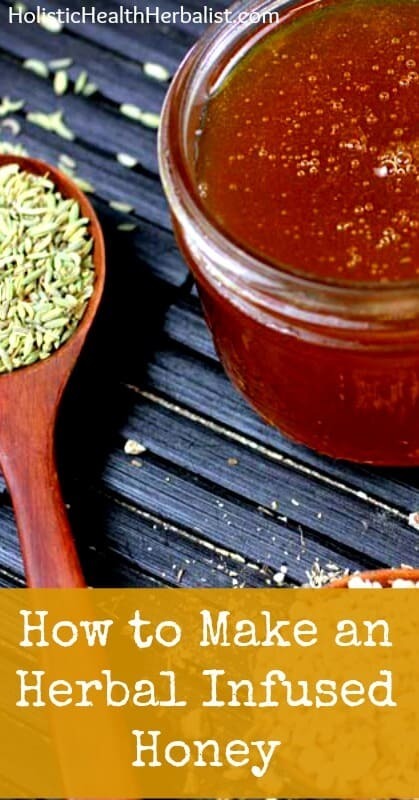 There are two ways to prepare herbal infused honey with fresh herbs. The first is to make infused honey with the aerial parts of plants, i.e leaves, petals, flowers, ect. The second method is making infused honey with fresh roots. The most important thing to remember when making honey with fresh herbs is to let them wilt first. The best way to do this is to put your fresh herbs of choice into a paper bag for a day or two to help remove most of the water content. If you don’t remove the water it can potentially make your infused honey go rancid and that would just be a sad waste of tasty honey and herbs. • Once the herbs are wilted, give them a rough chop, place them into a very clean mason jar and then cover them with raw honey until you just 1 inch from the top of the jar. • Use a chop stick to remove any bubbles by gently stirring the herbs. Make sure that they are completely covered with honey. • Wipe the jar clean and seal it with a sheet of wax paper to make the lid easy to open. 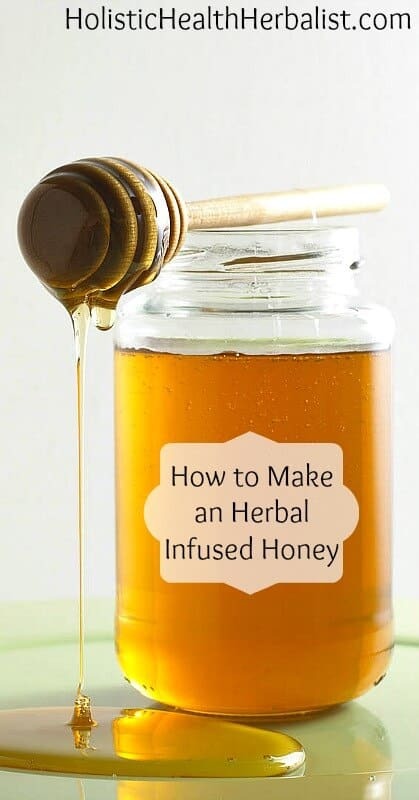 • Place the jar on a sunny windowsill to help the herbs infuse the honey. • Steep the mixture for 2-6 weeks, watching very closely to make sure that no mold forms. • Once the steeping time is up, place the jar in a bath of very hot water to help liquefy the honey. • Once liquefied, strain out the herbs through a stainless steel mesh strainer . • Bottle, label , and store in a cool dark place! • To prepare fresh root honey, first scrub the roots clean and let dry completely. • Once dry, roughly chop the roots. • Measure out 1 part roots to 4 parts raw honey . For example, 1 cup roots to 4 cups of raw honey . • Now here’s the tricky part, you should still have very close to 4 cups of honey. If you have more, you need to simmer the honey a little bit longer on very low heat (do not walk away from honey heating over the stove! You might end up with a gooey mess!). If you don’t, the honey may ferment. Even though this method does not use the roots, leaves, or flowers of plants, it does use the essential oils of plants. Aromatic honeys are prepared using essential oils and are excellent at delivering their flavor and healing properties to tea, coffee, dressings, marinades, and baked goods. These honeys are also great digestive aids especially if taken after a heavy meal. Important note: NEVER take essential oils internally unless the source is food grade and of the highest quality. If done correctly, both fresh herb and root honeys can last indefinitely. You can mix 1-2 drops of essential oil per 1 tsp of honey for adults. Mix this is water or take it straight depending on the oils you use (this is VERY important). To learn more about ingesting essential oils check out this post. If I wanted to infuse a jar of honey with essential oils will the oils eventually separate? Maybe if the honey was sitting for a loooong time, but in my experience the essential oils have stayed pretty well mixed in 🙂 You can always stir the honey as well if you like. I was trying to infuse honey with fresh herbs. But I wanted to know if I wash the herbs will it be okay to infuse it as long as I dry them? And how long should I dry them. I grow herbs such as sage, basil, lavender and rosemary all of which I wanna infuse with honey. Hence can u please tell me if it’s okay to wash them as the leaves had some dirt on it and also can I use flowers to infuse or just the leaves part? Please reply ASAP as I wanna make the infusion asap. Thank u for ur recipe above. As long as you dry the herbs completely you should be good to go! I usually press them between some paper towels and they are fine to use!